Sinking beers is a staple activity of almost every Party. A Bucks Party is no exception to the rule. There is no better way to celebrate your final days of freedom than by sharing a few cold ones with your nearest and dearest. That’s why you shouldn’t waste your time with bottom-shelf, university grade standards. Let’s Wicked Bucks take you to where all the magic happens and give you a taste of liquid heaven. ON this Brewery Tour you’re guaranteed to get the head of your dreams. Roll up, roll up, the bus to your Nirvana is ready to depart. Little did you know, it’s hidden in the heart of Hobart and there’s actually more than one. You may have heard of them before; they generally go by the name of a “Beer Brewery”. These venues serve as a meeting place for people of all ages, and it’s your dream come true. At each stop, you’ll have your pick of the very best golden nectars this town has to offer, and you won’t even have you worry about arranging a designated driver. Wicked Bucks has done the hard yards so that you can kick back, relax and spend your time arguing about which brew was best. When you’ve finally agreed that your finance’s Dad is right (good choice) we’ll fill your bellies with a big spread of real man’s food. We weren’t kidding about this being a dream come true. Don’t let anyone ever tell you that you can’t organise a piss up in a brewery. 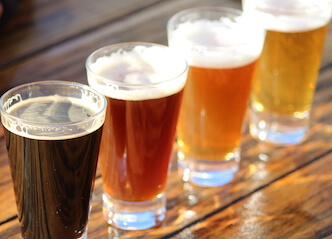 A Brewery Tour is the ultimate opportunity to bond with your brews! Nothing says bromance like a day spent on the beers together. Our Brewery Tour will have you pulling out the “I love you man” before you know it. We promise not to let your Missus know that she might have some competition. Breweries sure know how to serve some sweet, sweet head. These frothy experiences are set to blow your 16-years-old, first time out of the water. This is an activity that has something for everyone. 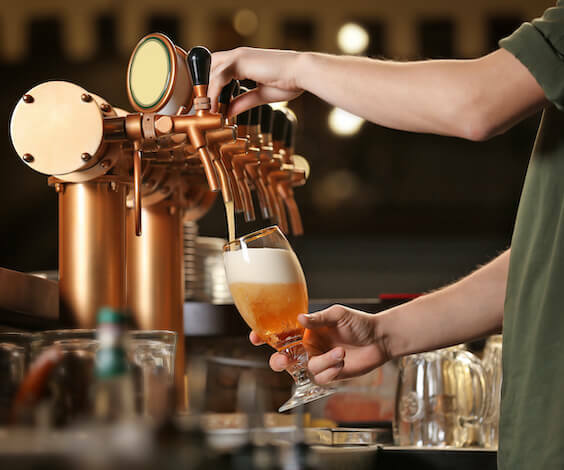 Even if you’re not the world’s biggest beer drinker (you may change your mind after this tour), these joints generally have a small but mighty spirits and wine menu too. It may be sold as whiskey, but we believe the correct term is liquid confidence. When you finish your tour and are gearing up to hit the nightlife afterwards, all your single mates will be singing your praises. You can thank us later. This is the perfect party package for the Buck in search of an unforgettable Hobart adventure with his mates. Two whole nights’ of accommodation and partying in Hobart’s CBD! Day one finds you partying on both land and sea with a private boat charter and party bus pub crawl, before finishing off at one of Hobart’s best gentlemen’s clubs! After you sleep it off, day two treats you to a full day brewery tour, group dinner, and exclusive nightclub entry! The hangover many only last for a day, but the memories will last a lifetime – the perfect way to send off your buck before his big trip down the aisle! Are you in search of the finest Buck’s Party that Hobart has to offer? Here at Wicked Bucks, we think we have tied it down to a knot with this awesome package! You will start off your adventure with a paintball battle, with a “rookie” 300 paintballs each! We have then set you up with an exclusive brewery tour at one of Hobart’s best breweries, to sample some of the freshest brews going. From there, we move in to the evening, starting with an unforgettable Bus Pub Crawl, with 4 free drinks and a delicious dinner – the best part is you get to choose the clubs! And if that wasn’t enough, we have set your whole party up in 4-star accommodations for your night of debauchery, a great place to lay your head when the dust settles! Hobart may be one of Australia’s capital cities, but it’s not like the rest. There are no towering glass skyscrapers here. Instead, the streets are lined with old Georgian buildings, former warehouses and port buildings converted into small restaurants, cafes and craft shops. Although the beaches are picturesque, the spectacular scenery of Tassie isn’t limited to the Coastline. Driving inland, you’ll find rugged mountains, great expanses of green and yellow fields laced with tall forests and sparkling highland lakes. Although it used to be the punch line of every Aussie joke, Tassie is having it’s moment now. The tables have turned, and this Southern state has only one thing to thank for that: Hobart. So make sure you get to this tiny town before the rest of the country catches on. All you need to do is say the word, and Wicked Bucks can make it happen.